While other companies have changed over the years, altering their look with every passing fad, Henry Watson Potteries has remained gloriously the same. Henry Watson still make things the old-fashioned way, using time-honoured techniques and the finest quality materials to create products that are refreshingly old-world. Each piece in the Charlotte Watson range is a lovely creamy shade, accented with delightful nostalgic flourishes. They’ll look and feel just as at home in a traditional country kitchen as they will sitting on any modern kitchen bench. Fashions come and go with every passing week, but true style is timeless. Vintage-look print on the surface. 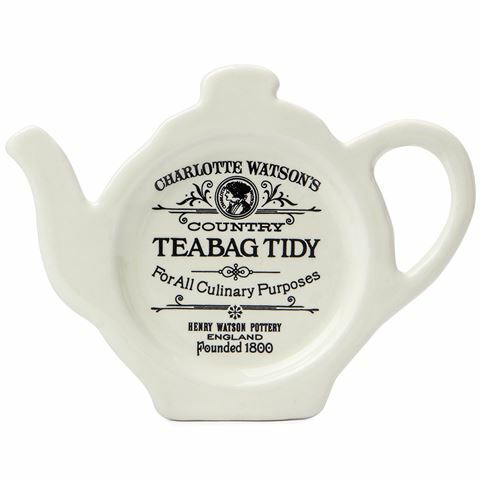 A perfect place to put your teabags once they've been used.